Enjoy an oriental themed slot game by Pragmatic Play at Wicked Jackpots Casino. 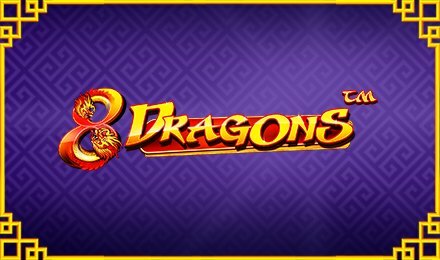 8 Dragons slots is a 5-reels, 3 rows and 20 paylines game that benefits from free spins, stacked symbols, wilds and scatter symbols. Let your luck bloom as dragons make most of the reels while you spin them. Other symbols you will find landing on your reels are Tigers, Lions, Fish, Gold Coins, Gold Ingots, 10, 9, A, K, Q and J. The aim of 8 Dragons slots is to form winning combinations from left to right of the slot grid. Wins are always made on active paylines. You could also use the Autoplay option to your advantage. This option allows you to select 10, 20, 30, 50, 70, 100, 500 and 1,000 auto spins. Amount of Lines Selection: Coin values range from £0.01, £0.03, £0.05, £0.10, £0.20 and £0.50. Coin Values: Coin values range from £0.01, £0.03, £0.05, £0.10, £0.20 and £0.50. The Dragon takes form of the wild symbol. When it appears on the reels, it takes up two positions on the reels. When this symbol forms part of aa winning combination, you are awarded 2x your stake. Pink Dragon: 5 Free Spins – 8x, 10x or 15x Wild Multiplier. Purple Dragon: 8 Free Spins- 6x, 8x, 10x Wild Multiplier. Green Dragon: 15 Free Spins- 3x, 4x or 6x Wild Multiplier. Blue Dragon: 20 Free Spins- 2x, 3x or 4x Wild Multiplier. Red Dragon: Mystery number of free spins and multipliers. Launch 8 Dragons slots now and watch your luck unlock with lucky symbols on the reels.